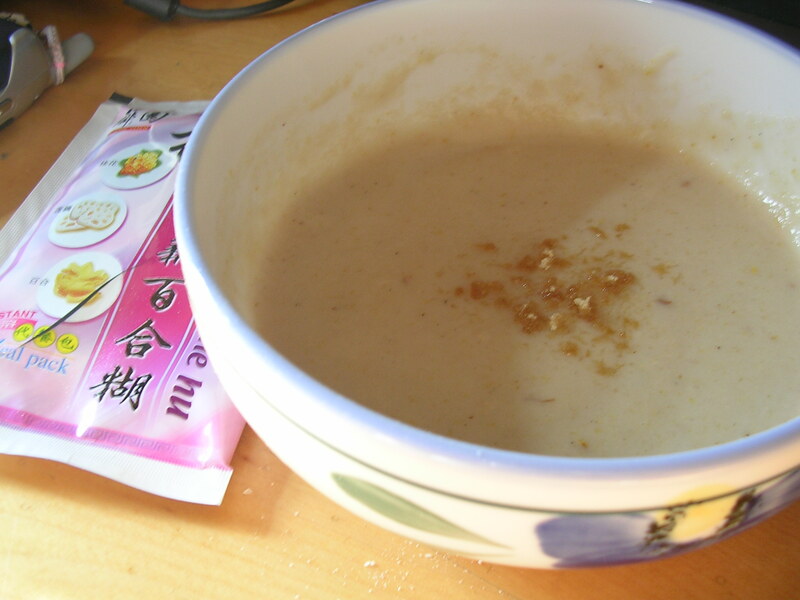 1 packet of Chinese instant breakfast, prepared with hot water and a sprinkling of brown sugar on top (~200 calories?). I'd forgotten that I still have some packets of this stuff, which I bought 2 years ago at my dad's suggestion for a breakfast option. I was getting sick of eating oatmeal all the time, and this was a really nice alternative. It doesn't have much texture to it, so I suppose it's similar to cream of wheat, but the flavor is not nearly as bland. It's called 桂花莲藕白合糊 "gui hua lian ou bai he hu", which is a compound term that literally means sweet osmanthus, lotus, and lily in a creamy soup (sorry, I read a poor translation from somewhere, so what I thought was laurel is actually osmanthus). I used to love a certain type of breakfast soup that my mom would make, using crystallized osmanthus flower sugar and water chestnut powder, which was so incredibly fragrant and delicious that I still have really fond memories of it. Unfortunately osmanthus sugar is really hard to come by, and a small jar of it costs a pretty penny, so I haven't really gotten a chance to eat it again. This instant breakfast comes sort of close in terms of flavor, and it sure has a nifty ingredients list: lotus root powder, Job's Tears (coixseed), lily, lotus seed, Chinese yam, tuckahoe, gorgon fruit, brown rice, sugar, grape sugar, and fresh sweet osmanthus flower. Haha, oatmeal doesn't even compare. 1.5 cups of white rice (300 calories), 6 oz. lobster sauce leftovers (210 calories). Yeah… I told you this lobster sauce business lasted a long time didn't I. It's almost done though haha there's enough left for one more meal. Tall Tazo chai tea latte with nonfat milk (170 calories). I was in Central Square and didn't have anything to do for an hour before my friend's Korean meatfest dinner, so I took up a space in Starbucks and did some MCAT studying. The latte style Tazo chai is a lot better than the regular chai I had a few years ago from Starbucks, which was more watery and stronger in flavor. I enjoyed it more mellowed out with the milk. 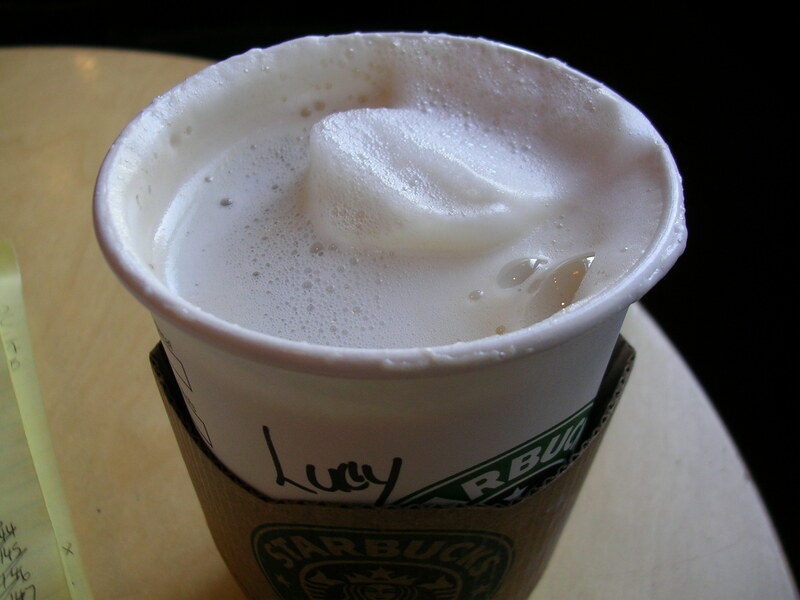 I was surprised, however, to find my tongue tingling after a few sips of this latte, and it was a pretty strong tingling that lasted throughout the entire drink. Must have been the spices in the chai. 1.5 cups of white rice (300 calories), and lots of korean style meat haha. I'm terrible and didn't remember to take any pictures, but one dish was bulgogi, which had a steak type of meat (thinly cut and marinated), sauteed in a red Korean chili sauce that was mildly spicy, along with some onions and mushrooms (my best guess is that 1/2 lb of bulgogi, which is 8 oz, is about 450 calories). The other dish was samgyeopsal, which are lettuce wraps with thin pieces pork bacon, all wrapped up with some sauteed garlic, sesame oil, and some sort of sweet/spicy Korean red paste (ssamjang?). Mmmm yummy! I usually don't like spicy food, but tonight's dishes were just mildly spicy enough that it wasn't overwhemling. Can't figure out the nutritional value of the lettuce wraps, nor do I have an inkling of exactly how much I ate of it, but suffice to say that it was not low-cal fare haha. I also had a small glass of red wine (4 oz, 84 calories), half a glass of white grape juice (6 oz, 120 calories), a little bit of skim milk (4 oz, 40 calories), and 5 soggy Entemann's donut holes (275 calories, damnit Tony!). Boy the calories from the drinks really add up. I think I should try to stick with water in the future haha. Definitely went over the daily allowance today, probably by a good deal, since everything I ate, not including the meat dishes, came out to be about 1700. Man. But I made an exception for the little get-together, to see people I haven't seen in a while, and to eat free food of course. This entry was posted on Wednesday, March 28th, 2007 at 1:45 pm	and posted in beef, beverages, breakfast/brunch, Chinese, friends, Korean, pork, snacks, Uncategorized. You can follow any responses to this entry through the RSS 2.0 feed.